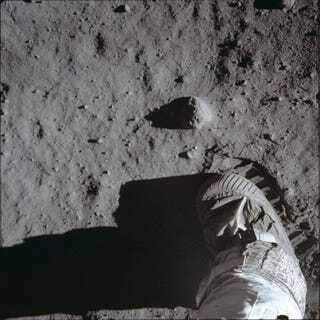 You're looking at Buzz Aldrin lifting his boot before taking the photo of the most iconic footprint in history. It's one of the many discarded Apollo images stored in NASA's archives. Here's a collection of those rare, funny, intimate, and always fascinating views to celebrate the 45 anniversary of the landing on the Moon. Blurry portrait of mission commander Neil Armstrong in Command Module during Earth Orbit phase. Gorgeous view before landing: Crater Hartmann, and beyond it, crater Green from the LM. The Eagle has landed: Tranquility Base and LM shadow from LM window. Solar wind staff in surface shown in the sun struck final frame of film magazine "S"
These two panoramic views of the lunar surface were photographed from the LM before and after the Moonwalk. Note the numerous footprints made by the two crewmen during the EVA period. Tranquility Base and flag from LM window. Did you know that the flag was blown over by the exhaust from the ascent engine during liftoff of Apollo 11? Buzz Aldrin witnessed! One of the last shots of Moon during trans-Earth coast. Traditional post-flight cake cutting ceremony was altered since Apollo 11 astronauts, Neil A. Armstrong, Michael Collins, and Edwin E. Aldrin, Jr., were restricted to the Mobile Quarantine Facility. The gold replica of an olive branch, the traditional symbol of peace, which was left on the moon's surface by Apollo 11 crewmembers. Astronaut Neil A. Armstrong, commander, was in charge of placing the branch (less than half a foot in length) on the moon. The gesture represented a fresh wish for peace for all mankind.